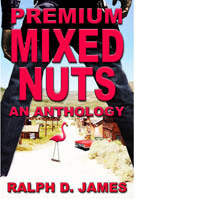 Long ago, a high school creative writing teacher told RALPH D. JAMES he had an excellent grasp of the absurd. In 2014, while creating sample blog templates to show writers how he could help them promote their work, he wrote several paragraphs in different genres to go with his templates. His lovely bride, Clarice, an author herself, suggested he expand one of them into a short story. The result was “Just West of Clovis” in Out of the Storm, an anthology published by Chalfont House. RALPH: I didn’t know it until recently. I’m still not sure how it happened. I think my wife had something to do with it. Who supported you in this dream? RALPH: My lovely and talented bride, Clarice G. James, pushed, shoved, dragged–uh, I mean supported me. RALPH: Historical/western/SF. I’m willing to try most genres, but I’ve had a better response with these three. What do you want your readers to experience while reading your books? RALPH: Tolkein, Michener, O. Henry, Shel Silverstein. RALPH: I’ve been working on a collection of short stories. Most are westerns; some are mysteries. Then there’s one lonesome sci-fi thing. How would you encourage others who have a story to tell? What did you do before you became a writer? Or what do you do besides write? RALPH: I was a project engineer for a large construction company. Now I serve as Tech Support for my wife. What is the most enjoyable part of the writing process? RALPH: Writing the first paragraph. RALPH: Writing the last paragraph.